First Look - "Lucky 13"
As June approached, preparations were underway for the trip to Windsor Locks, Connecticut, where the Worlds #1 New Hosta Show would be held. Plants had to be selected, dug, potted (very clean pots), and made to look their best. 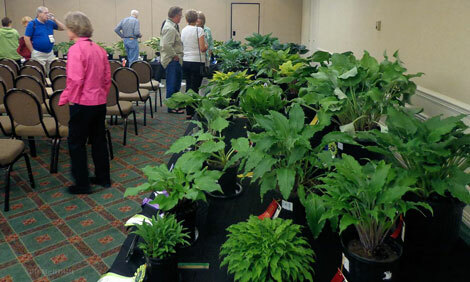 After all, First Look is a SHOW to exhibit the newest and best of the hostas. There were the minor things to take care of, as well, like sending in my registration, reserving a room, making plans with friends, and luggage to pack. This year was going to be a mind-blowing experience. 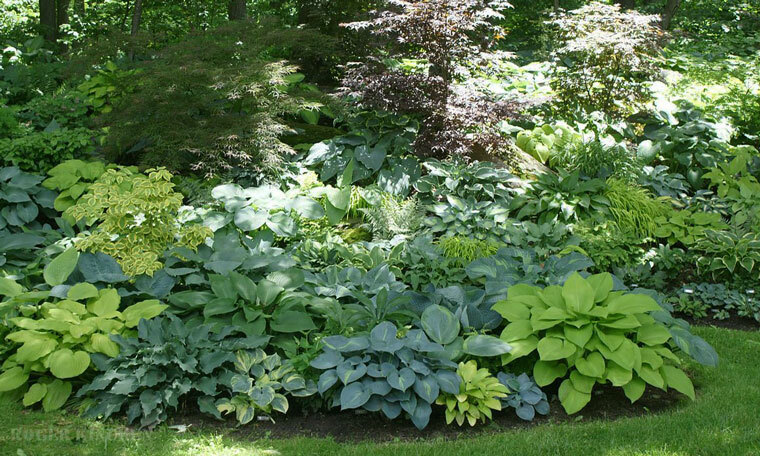 Hostas and Friends, what more could ya ask for! The night before departing I headed over to meet friend and fellow hosta buddy, Cheryl Cravino, of the famous Hosta Amour nursery. Last minute details required that I deliver a few flats of mini plants she would use in her “Fairy Garden” presentation. We chatted and laughed as plants were loaded. I would go down early to help out where I could and to give me a head start. Cheryl and Deb Myrick would both be working late Friday before heading down together. With some plants for exhibit, some for friends, some for auction, and some for the contest loaded, it was time for a good night’s sleep. I woke early, with excitement, as I wanted to be on the road by 10 a.m., arrive by noon, have lunch, and catch up with friends. As luck would have it, it was a cool morning, with lots of clouds. I finished loading the car, programmed “Mabel” the GPS, and gave my pup, Morgan, a cookie and off I went, just as the rain started. Not rain, nor snow, nor sleet would keep me from First Look 13. I arrived early, enjoyed lunch at the hotel, and scouted the lay of the land. I knew where the classes, vending, and banquet would be. Then I ran into Kathie Sisson, who was setting up the “check in station.” I signed in, got my gift plant, voting cards, and ID badge, then chatted a bit before heading out to help the dynamic duo of Bill Meyer and Carol Brashear, who are the hosts of First Look. Unloading plants of all kinds for an array of different functions soon followed. I helped set up display tables, then finished unloading plants. On the final cart of plants, I recognized the Keynote speaker walking towards the entrance. Yes, world famous hybridizer, photographer, friend, and speaker, Ron Livingston, had arrived. 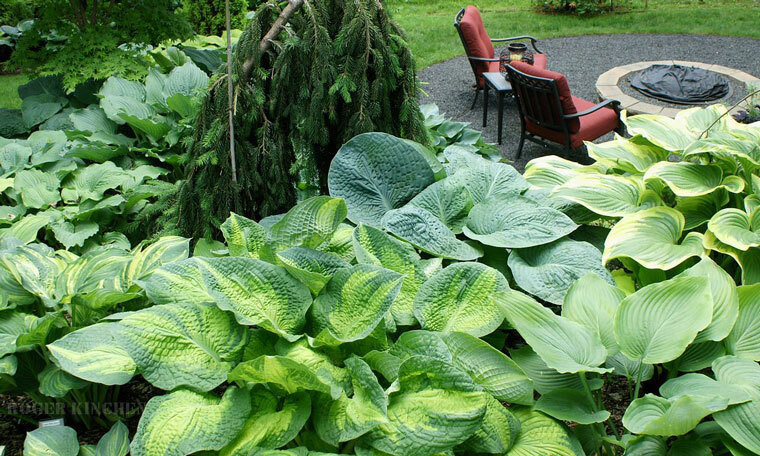 As Ron and Fran settled in, more and more hosta fanatics began to arrive. The hotel was abuzz with conversations and laughter. I ran off to the class I had signed up for, which Kathie Sisson was teaching, with the joint knowledge of Carolyn Schaffner and Cathy Felton. Judging Clinic I was fantastic. Focusing on cut leaf, we learned what goes on behind closed judges’ doors (sworn to secrecy on that! 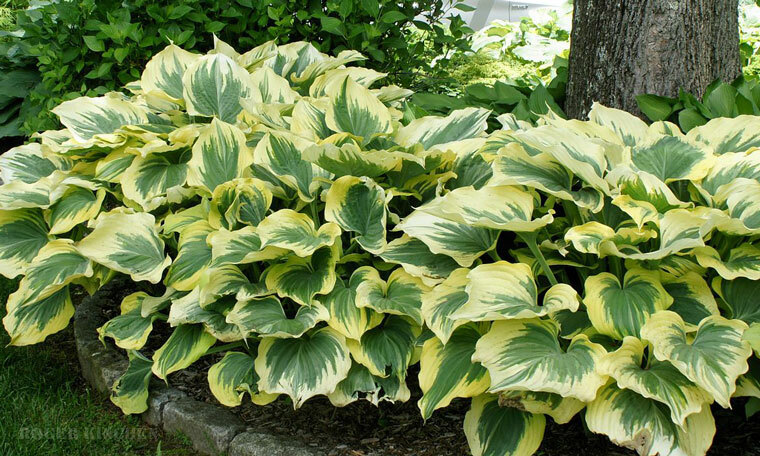 ), what they look for, see, and comprehend in their efforts to educate the public about the genus Hosta. We studied the guidelines and procedures, then took a test on the basic understanding and function of a hosta judge. Following that, the real fun began, live review of cut leaves. The judges formed a panel and educated us on the techniques used to determine what makes the perfect leaf, how points are deducted, and how it applies to new plants. In the class we learned many wondrous things as we discovered much about judging and the steps to becoming a judge. Step 1 completed, I passed! Now I need to volunteer on some panels and get some experience. After class I got a text from Ron and Fran asking if I had eaten yet. We met in the lobby and decided on the Shade Bar and Grill located in the hotel. Bob MacLachlan joined us, and talk of hybridizing, collecting, growing and everything in between relating to hostas filled the night. The food was really good and the company even better. After the three-hour dinner and conversation, most called it a night, as activities would begin early the next day. I said goodnight and headed to the Hostatality, hosted by Paula Lehtola and Mary Arnberg. Laughs and antics followed, with Jeff and Sue Tucker, Viktoria Serafin, and Cindy King and a few other die-hard hosta-fevered friends. Then I found my way back to the room in the wee hours of the morn and slept for three hours before heading down for COFFEE. Saturday had arrived and is the focal point of the weekend events. I began the morning by assisting Carol in setting up the Best Plant in a Pot, Largest Leaf and Oddity contest displays, and voting. As other attendees started to waken and come downstairs, we headed down to the continental breakfast included with the registration. Yummy BACON. Then, on to vending where I acquired Hosta ‘Biddy Blue’, ‘Lost World’, ‘She’s a Dancer’ streaked, and a ‘Fairy Hair’ Japanese Maple. 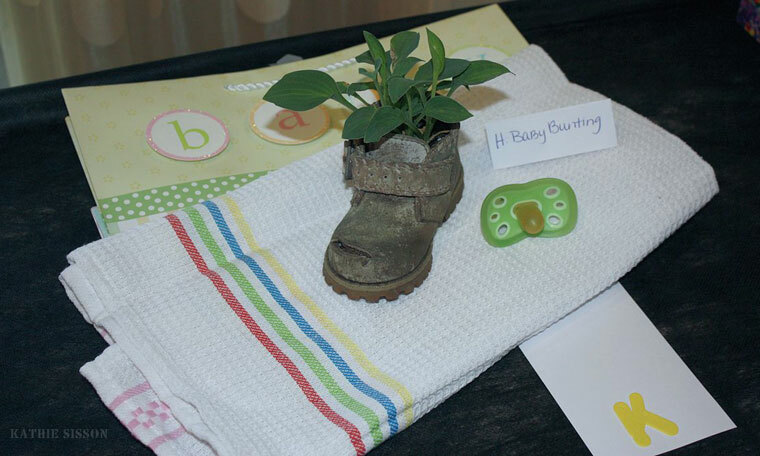 Many of the vendors carried some new and exciting things, some classics, and even some one-of-a-kind plants. It was a GREAT start to the day, and it was only 9:30 a.m. I then dropped off my five entries in the First Look competition entry station. Each was assigned a number, and I received a receipt. They would be photographed and placed in their category for display and judging, a task Bill Meyer, Kevin Plumley, Roger Smith, and Kathie Sission have mastered. The first presentation was about to begin. Carol Brashear was speaking on that menace to hostas everywhere - voles. Her lecture was a detailed intro on how to recognize, trap, and protect hostas from the varmints. She shared her insights on baits, caging, and traps, and what worked best. The wire baskets and how to plant a hosta in them are always a topic of interest. She presented a slide show that illustrated many of the techniques used to prevent vole damage. She even had door prizes, which included new, no-touch traps from Ortho. Following Carol’s presentation was Cheryl Cravino’s on Fairy Gardens. 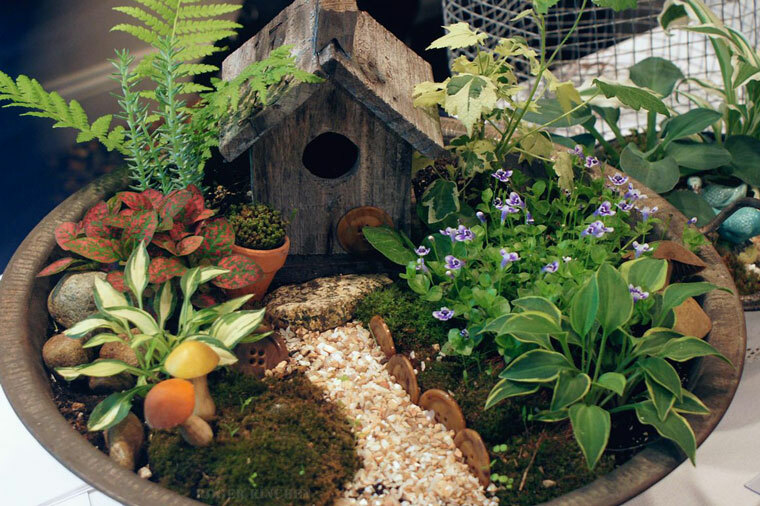 She had several displayed, using repurposed containers, custom-built fairy houses, and some great miniature plants. She told the story of how her grandmother would make them clap their hands when stepping off a path to let the little magical creatures know to watch out. Also, while in the woods, her grandmother explained to her she had to be very quiet to catch a glimpse of the woodland fairies. Was her grandmother just very clever in keeping the kids quiet, or was there some truth in her tales of magical fairies? I guess you will have to plant your own garden to find out. I followed these great presentations with the view of the exhibits. 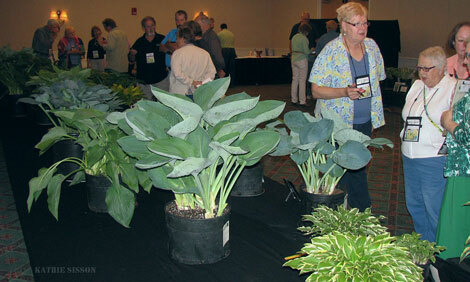 There was a table set up to guess the ID of eleven hostas, the Name That Hosta Contest. I only got five of them correct. 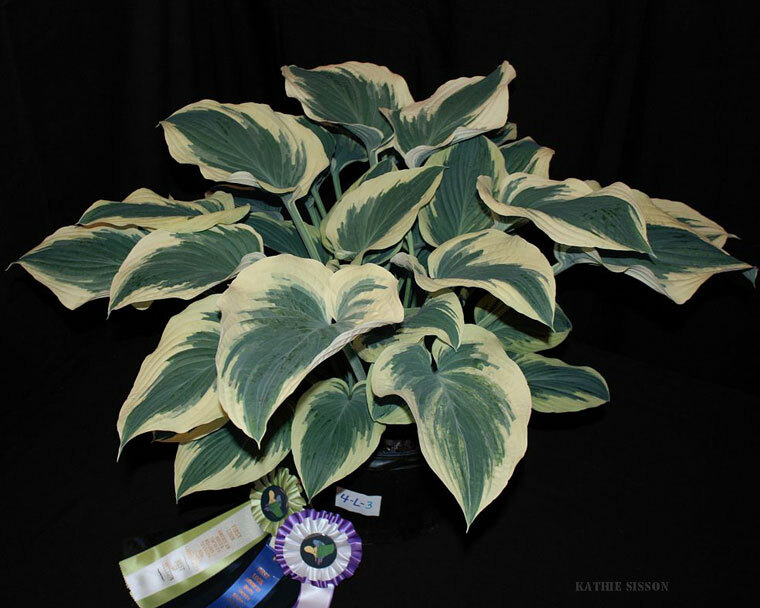 On display for voting purposes were best hosta in a pot and themed planters. 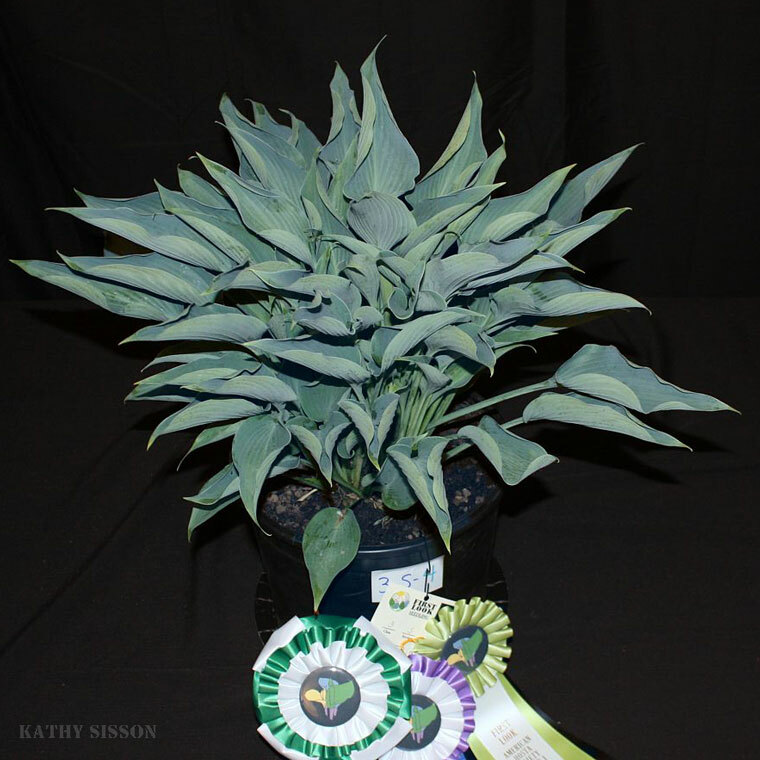 John O’Brien won best hosta in a pot, with his well-grown ‘Spring Fling’, and Cheryl Cravino won themed planters with ‘Baby Bunting’. A large group was gathering to view the Best in Class winners in the main competition. 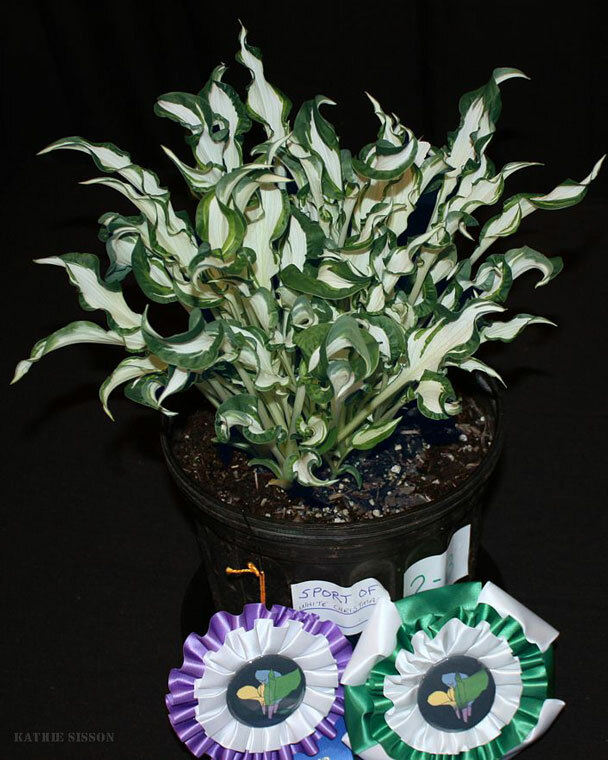 Ribbons had been placed on the hostas displayed and the judges presented some discussion about what lead to this and that ribbon. It’s always very informative to hear what the judges thought processes are in choosing the top contenders. With everything wrapping up for the day, a scheduled break before the banquet was needed. All the exhibit plants had to be picked up, while everyone prepared for dinner. The banquet began with an auction. Bidding was furious and good-natured. Some great plants found new homes, including ‘Blushing Banana’, donated by Matt Sanford and now living here at my house. Several of Ron Livingston’s intros also made it into the auction, including ‘Atom Smasher’ and ‘Presweetened’. With the auction complete, Ron Livingston took the podium and presented “Have Hosta Gone to the Dogs?” The presentation was themed on how ALL the dog breeds originated from one gene pool, the wolf. There being several species of hostas with a wider source of genes, where could we go with hybridizing them? Ron’s presentation involved feedback from the attendees, what they would like to see in a hosta, and the thought that any idea is a moldable concept. Just look at how far red in a hosta has come and imagine how far dogs have evolved from the wolf. The conclusion was reached that much more can be developed and shared in the world of hosta. The meal was served and conversation was ample. Concluding the day, awards were presented for both judges’ choices and attendees’ choices. John O’Brien’s ‘Snow Squall’, a curly new sport of ‘White Christmas’, won both new sport awards from the judges and the attendees. Kathie Sission’s most unique powdery blue folded seedling, which she will name ‘Billfold’, won the judges’ choice for best new seedling. Chick Wasitis won the attendee vote for best new seedling, with yet another of his magnificent cream-edged beauties. A rock-n-roll classic name is in the works for Chick’s new plant that he will no doubt reveal on New Year’s Eve, for the unveiling of the First Look 13 website. 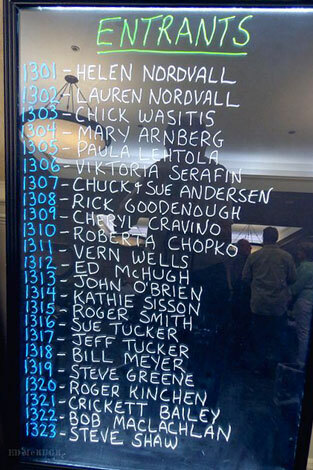 Carol reminisced about this year’s adventure, prayed for those no longer with us, and thanked everyone for making First Look 13 one to remember. After the meal, many retired, while those of us who can’t get enough of the company of other hosta fanatics sat around sipping wine and thinking of the next new dog breed! That would be hosta breed! Sunday morning came much too quickly, many said goodbyes over breakfast before heading out to the three fantastic tours of the John O’Brien, Matt Sanford, and Brashear/Meyer Gardens. All the gardens were exceptional and so beautiful. At the O’Brien nursery and gardens, visitors were given the chance to see ‘Snow Squall’ up close and personal, while shopping for that must-have hosta and perusing the display gardens filled with conifers, perennials, and of course, hostas, hostas, and more hostas. Matt Sanford’s garden showed the detailed work of an exceptional hybridizer, from his start and his hopes to his goals and his first realizations of them. His creations, such as ‘Madison’, ‘Yellow Ledbetter’, and many future intros were on display. Watch for his ‘Rumor Has It’, ‘Look at Me’, and ‘Luscious Legs’ to come into the market. They are spectacular. My last stop of the day, before heading home, was the garden of Carol Brashear and Bill Meyer, a garden built by hybridizing and collecting. Many variegated plants were displayed along the paths, mingled with some of their own creations and discoveries, such as ‘Pole Dancer’, ‘Flaming Queen’, ‘Black Licorice Sticks’, and ‘Mayflower Moon’. A visual delight of texture, color, and form was everywhere in the garden. Thank You ALL for making First Look 13 one to remember and I hope to see everyone at First Look 14, where memories and friends are forged.